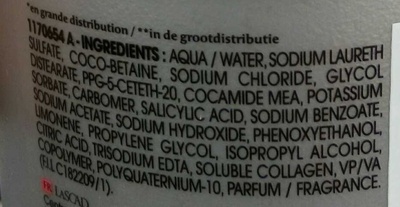 AQUA / WATER, SODIUM LAURETH SULFATE, COCO-BETAINE, SODIUM CHLORIDE, GLYCOL DISTEARATE, PPG-5-CETETH-20, COCAMIDE MEA, POTASSIUM SORBATE, CARBOMER, SALICYLIC ACID, SODIUM BENZOATE, SODIUM ACETATE, SODIUM HYDROXIDE, PHENOXYETHANOL, LIMONENE, PROPYLENE GLYCOL, ISOPROPYL ALCOHOL, CITRIC ACID, TRISODIUM EDTA, SOLUBLE COLLAGEN, VP/VA COPOLYMER, POLYQUATERNIUM-10, PARFUM / FRAGRANCE. (F.I.L C182209/1). Product added on March 12, 2016 at 11:15:09 AM CET by sebleouf. Last edit of product page on October 17, 2018 at 4:59:29 PM CEST by sebleouf.